Two Super Adorable Ways To Dress Up A Plain Old Ponytail! Are you tired of making a regular ponytail each time you are running late and need to step out of the house? Watch this video to learn new and creative ways to make different ponytail styles which are easy and quick! What you need: Comb, Hair Ties, Bobby Pins. Difficulty Level: Easier Than a Regular Ponytail! Watch The Video Now! PLUS: Subscribe to POPxo on YouTube for original videos + our favourite videos from around the web! Step 1: Tie the crown section of your hair and make a ponytail. Step 2: Take a strand of hair from the ponytail and wrap it around the hair tie. Secure with a bobby pin. Step 3: Now, tie the lower section of your hair and repeat Step 2. And you are done! 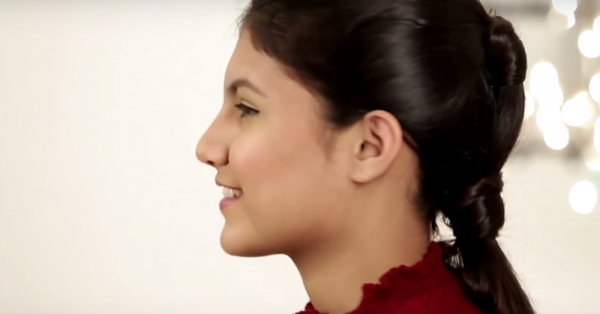 Your double looped ponytail is ready in 2 minutes! Enjoy more fun stories on the super cool POPxo app… Click here to download! Step 1: Divide your hair into two sections. Step 2: Make a low ponytail from one section. Step 3: Now, start twisting the upper section of your hair from the other side and take the twisted hair towards the ponytail. Wrap it around the hair tie and pin. Step 4: Repeat Step 3 for the lower section of your hair. Step 5: If you have any left out hair, take that strand of hair and wrap it around the ponytail. Step 6: Tie the ponytail for a better grip. So which one is your favourite pick out of these two? MUST-READ: 3 Makeup Mistakes EVERY Girl Makes – Here’s How To Fix Them! MUST-READ: 7 MAGIC Beauty Hacks With Just Baking Soda!